Lawffice Space - Employment Law Blog by Philip Miles: First Child Labor Law in U.S.
First Child Labor Law in U.S.
Can you imagine those lazy eleven year-olds and their mere ten hour work days? And don't even get me started on those nine year-olds that don't even have jobs yet! Alright, that was (hopefully obvious) sarcasm, and so detached from our societal norms that no one would take me seriously. I'm actually poking fun at nineteenth century America. Today marks the anniversary of the first child labor law in the United States, enacted in 1842. The law reportedly "established the 10-hour day for children under 12; [and then in] in 1867, it forbade employment for children under 10." Keeping in mind that slavery was still in effect in much of the United States at this time, it's probably not surprising that there were not yet laws forbidding child labor. In less than a century from the enaction of the first child labor law we saw the abolition of slavery up through the Fair Labor Standards Act of 1938. It's amazing how radically our labor laws have changed over a fairly short period of time. 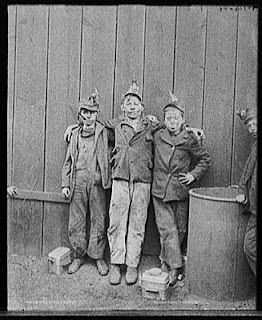 Image: "Coal Breaker Boys" from Library of Congress (1890-1910) - Call No: LC-D4-32069.